Mitt Romney talks with people at his event in Dubuque. Many of those in the crowd who greeted Republican presidential candidate Mitt Romney in Dubuque today backed his 2008 campaign and plan to vote for Romney again in the 2012 Iowa Caucuses. “It’s good to be here with you today and to say, ‘Hi,’ to some friends in Dubuque. You guys were helpful for me last time around. I expect you’re going to helpful this time as well — planning on it,” Romney said, as the crowd applauded. 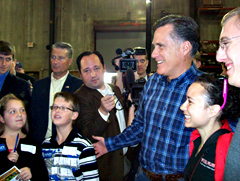 Romney’s speech (find audio here) was staged on the factory floor at Giese Manufacturing in Dubuque. Scott Rowley of Dubuque has worked at the plant for 12 years and he may now Caucus for Romney. But many others in the crowd, like Bonnie Stephenson of Dubuque, are those 2008 supporters Romney was speaking to directly. “I think he can do it this time,” Stephenson said after Romney’s speech. Jim Sullivan of Dubuque worries about the nation’s escalating debt and he liked hearing Romney’s promise to “slay” the “beast” of the federal deficit. Sullivan and Stephenson will both be Romney voters in 2012, as they view him as the party’s best candidate. Tracey Goedkin of Dubuque is another long-time Romney supporter who was in the audience today. “I like his philosophies and what he stands for,” Goedkin said. She brought her daughter to see Romney, as her daughter’s class is having a “mock Caucus” soon. Romney posed for a picture with the kids. Romney’s other campaign stop was in Davenport earlier this evening, where he spoke at Iowa American Water, an investor-owned utility. Iowa Democrats issued a statement tonight, suggesting Romney’s appearances were like “commercial shoots” rather than traditional town hall meetings where voters get to ask questions, and the crowd merely got a chance to be “extras” in Romney’s next commercial. Romney held a town hall meeting in Sioux City last month where he took questions from people in the audience, then he made a brief statement to reporters about the death of Libyan leader Muammar Gaddafi.